A binman suffered burns to his hands and stomach after an explosion in the back of a refuse truck, his colleagues have said. 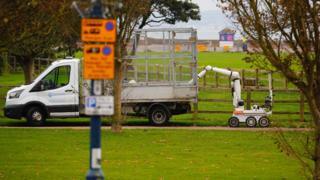 Roads around Southsea Common in Portsmouth were cordoned off for about six hours while bomb disposal experts examined the scene. Police said the blast was caused by a smouldering barbeque and a disused rocket-style firework. The refuse worker has been discharged from hospital with minor injuries. Refuse workers on the scene said their colleague was burned in the blast, which happened as he threw rubbish from a bin into the truck. Witness Ellie Bain said she heard a "loud bang" at about 11:30 BST. At about 17:10 BST, she tweeted: "A member of the bomb disposal team has now approached the common, all suited up." The cordon, near Palmerston Road and Clarendon Road, was lifted shortly afterwards. A police statement said: "We would like to take this opportunity to remind people of the importance of disposing of barbeques and fireworks safely."